Karissa N. Murphy is an Associate at the Law Office of Robert E. Mielnicki. Karissa N. Murphy received her Juris Doctorate degree from Duquesne University School of Law. 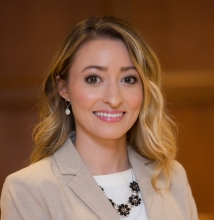 While in law school, Karissa N. Murphy participated in the Appellate Moot Court program, where she won first place in a national moot court competition hosted by George Washington School of Law. Upon graduation, Karissa N. Murphy received the Order of Barristers award, which nationally recognizes top law school graduates who have displayed exceptional advocacy skills. Karissa N. Murphy also worked in the Civil Rights Clinic helping indigent clients file expungements, pardons, and discrimination claims. Prior to joining the law firm, Karissa N. Murphy was a judicial intern to the Honorable Judge Judith F. Olson on the Superior Court of Pennsylvania.